Three for Three: Finals Game 2 recap | ENTOURAGE BASKETBALL INC. Determined to close out the best-of-three Finals series in two games, Entourage Basketball Inc. laid the groundwork for a possible sweep with a convincing 76 – 62 win in Game 1. Adding to the urgency was the fact that due to the looming Christmas-related travel, half the team would be unavailable for a third game. Pre-game circumstances were less than favourable too as Center Jean Baptiste, the league’s leading rebounder, was unavailable for the game as were multiple other key players (Sebastien, Mike). JB was an especially notable absentee, the big man played very strong defense in the first Finals match, stifling multiple drives to the hoop by the Monstars. The return of scoring guard Alejandro, he had last suited up in the semifinals, and the improving health of forward Josh did fill the team with optimism following the practice session leading up to Game 2. That and the fact that the squad was riding a 12-game winning streak into the contest. Lauris, Edouard & Ric: hot start. All that went up in flames as the Monstars got off to a fantastic start. Hitting their first 4 shots and racing off to an early lead, 14-2. Monstars three main scorers repeatedly got open as E.B.I’s defense scrambled hopelessly in the opening stages of the game. The reigning champs starting unit, Chi, Jerel, Lester, Ronnie and Alex executed well on offense, they just couldn’t find the bottom of the net. Turnovers also made things easier for the Monstars; their transition game much improved to the first match. Panic never set in, the two-time champions boast the deepest roster in the league, one of the best in the country, and as the opening quarter progressed, subs Andro, Josh and Dave put their stamp on the game. How? Increased effort and help defense. Josh opened the scoring for E.B.I with a freethrow after being fouled while snagging an offensive rebound. Andro penetrated into the heart of Monstars zone defense, or hit three-point shots and player-coach Dave led by example on D, taking the opponent’s topscorer out of his comfort zone, while also finishing on the break. By the second quarter the gap was closing rapidly. EntourageBBall was in rythm and then former professional player Jerel got going. Assists, points, leading the break, inspired defense resulting in steals, the tricky guard did it all to help wrestle the lead away from the opposing team. Leading by halftime, the starting unit calmly proceeded to prove their mettle, and expanded the lead to double digits. Defense to offense: Rel dishes, Dave finishes. Sadly during this phase in the game, an opposing player, starting guard Edouard, crumpled to the ground in distressing pain and play had to be interrupted for a long while. In true sportsmanship spirit, players from both teams and Cross-Over League’s Wong Shek immediately attended to him, it was quickly clear though that he wouldn’t be able to continue. Naturally the rest of the game couldn’t live up to the frenetic first half, the injury, later diagnosed as a ruptured achilles tendon, sucked some of the energy out of the building. E.B.I’s weekend team never lost their second half lead and were content trading baskets till the final buzzer. Monstars gave the 3-time champs a battle in both games, and were a fair and worthy opponent. The champs proved this season once again that depth and commitment trumps all. An international squad, 16 men of varying backgrounds, experienced, motivated: Entourage Basketball Inc.
After accepting their opponent’s congratulations, EntourageBBall players gathered in a somber team huddle in near-silence. Not even the usually chatty coach could string together the right words to put this achievement in perspective. 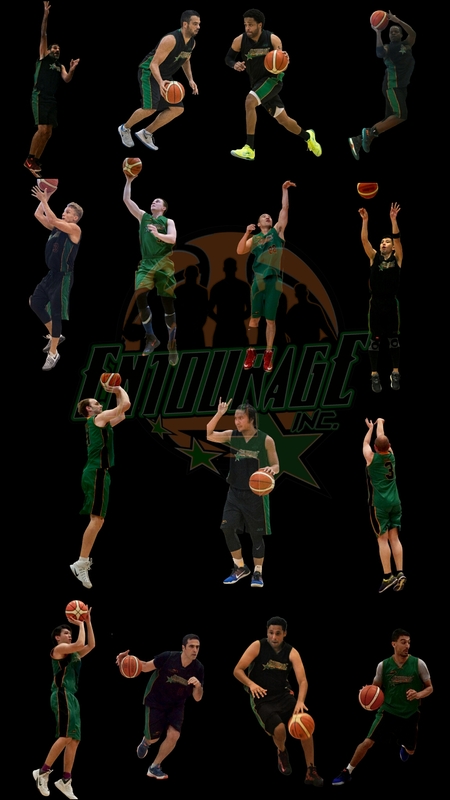 I took on the task of keeping EntourageBBall Inc afloat early 2015. Our longtime coach had abandoned the team because the fledgling but short-lived semi-pro league, ProAm SBL, was THE marquee Basketball event in Singapore back then and after failing to guide the team to any titles, he bailed.. Pulling double duty as a player on the Singapore Supras (SBL) and player-coaching Entourage in the Jammers Weekend league, we won our very first title in the Spring of 2015. Then things threatened to fall apart again. Cross-Over League’s second season was a Godsend, as our former league had become an embarrasment, manipulating standings and scores, influencing referees for certain outcomes, all the hallmarks of dirty sports. Placing emphasis on certain key criteria, practice, personal responsibility, respect, enjoyment and knowledge, we’ve had a blast these last 18 months. This is most reflected to me in the fact that 15 of last season’s 17 players are returning for the upcoming Spring ’18 season. It has been a true pleasure to help guide the team to a third consecutive title. Apart from my late teens, where i was playing with 4 of my best friends (on a club league team in Europe) , i have not had a better experience being around Basketball.